Pyramis > Sit On Kitchen Sink & Waste. 1000x600mm (Square Edge, 2 Tap Hole). 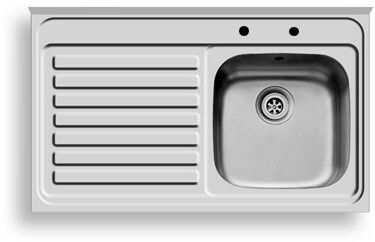 Sit on kitchen sink with square edge, left hand drainer, two tap holes and sink waste. Size 1000 x 600 mm. Stainless steel. Single bowl with left hand drainer. Size: 1000W x 600D mm. Sit on sink with square edge design. 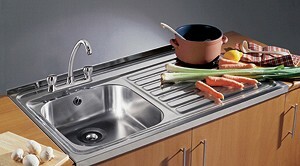 25 Year guarantee: Pyramis guarantee this kitchen sink for 25 years. 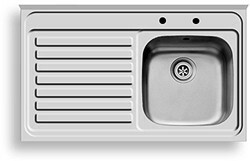 The Pyramis range of kitchen sinks adds a touch quality to your new kitchen. Pyramis has gained prestige and credibility all over the world, with their skilled staff producing quality goods, and with over 1,500,000 kitchen sinks produced each year. Pyramis is ISO 9001 certified, ensuring the highest standards of quality for their products.